Ellie Goulding showed off her fashion sense at a party Saturday night. In a black one-shouldered fringe dress and gold strappy stiletto sandals, the talented Goulding shined bright among the other guests. The party Goulding attended was the Dsquared2 party in London. It was part of the London Collection Men’s week. Other guests included Dolce and Gabanna, David Gandy, Chloe Green, and Zara Martin. Ellie Goulding hasn’t been spending much time out and about since she’s been working hard on her next album. On Instagram, Goulding posted that she’s been almost a complete recluse, but that she feels great. She may feel great, but she was concerned about her shoes while at the party, according to what she told her fans on social media. That post might have scratched the surface of an issue that Goulding and many other people her age has faced: anxiety about how she’s perceived. According to Elle Magazine, Ellie Goulding has admitted she’s not super confident about her appearance and never has been. The singer, dating Dougie Poynter (singer for McFly), used to have panic attacks about her looks and how people saw her because of them. During her “make-up and alcohol free” week, Ellie Goulding pushed through that confidence issue to post a photo to Instagram. Without her usual make-up, Goulding still looked stunning and healthy, but not all her fans thought so. Although the majority of the comments were on the positive side, there was a sprinkle of comments claiming that she was ugly or worse. Goulding responded to her “haters” on Twitter. Yaaaaaas! RT @yelyahwilliams: @elliegoulding mmmm beaming!! 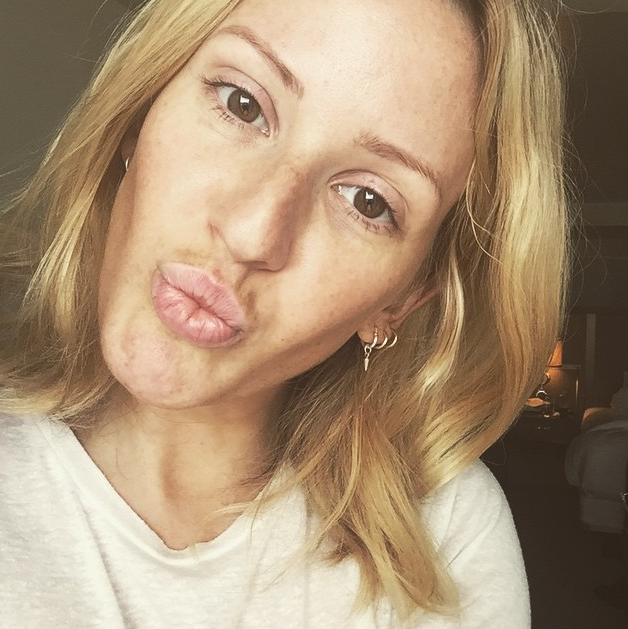 Asking for pictures of selfies from her fans where they were make-up free was a door for her people to show their support and Ellie Goulding added how much she loves them. The singer’s success is even greater when seen as something that came from overcoming the obstacle of her own self-image. Luckily, her fans have her back and Ellie Goulding won’t have to listen to the haters.